The 43-year-old golfer won his first major championship in 11 years. Home Today News The 43-year-old golfer won his first major championship in 11 years. Woods immediately hugged his caddie, Joe LaCava, before running to his 75-year-old mother, Kultida, as well as his daughter Sam, 12, and son Charlie, 10, who were waiting in the wings off the 18th green. His girlfriend, Erica Herman, was also there to greet him. 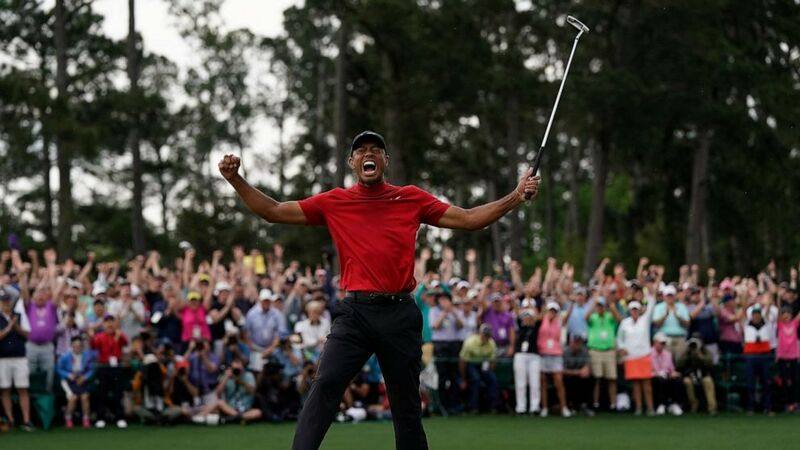 (David J. Phillip/AP) Tiger Woods reacts as he wins the Masters golf tournament, April 14, 2019, in Augusta, Ga. He hugged and lifted his son in the air as they walked together to Butler Cabin at the Augusta National golf course to officially record his score. “When I tapped the putt in I don’t know what I did, but I know I screamed,” Woods said after the tournament, as Patrick Reed, the 2018 Masters champ, put the traditional green blazer on him. Woods, who collected a $2 million prize for winning the tournament, noted that when he won his first Masters 22 years ago, his father, Earl Woods, who died in 2006, was there to greet him. 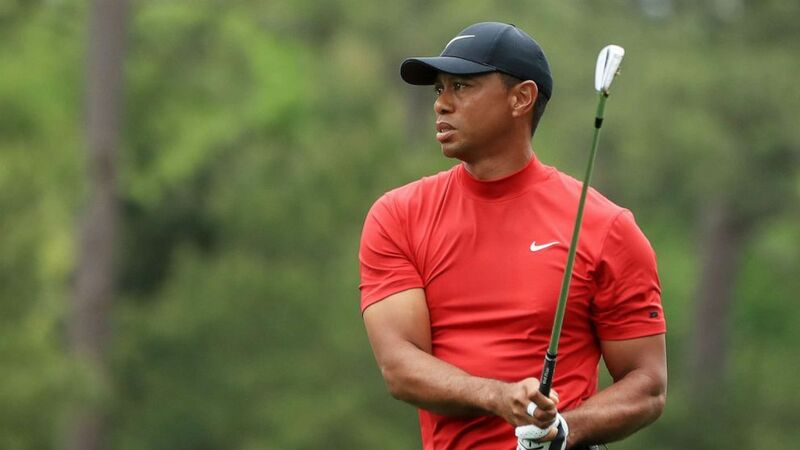 The 43-year-old Woods began the day two strokes behind Italian golfer Francesco Molinari, but by the 12th hole, he was tied for the lead, and jumped to the top of the leaderboard on the 15th hole. Woods finished the tournament 13 under par. Xander Schauffele, Dustin Johnson and Brooks Koepka all tied for second, just one stroke behind Woods. The victory marked Woods’ 15th major championship win, and his first since winning the 2008 U.S. Open at the Torrey Pines Golf Course in San Diego. 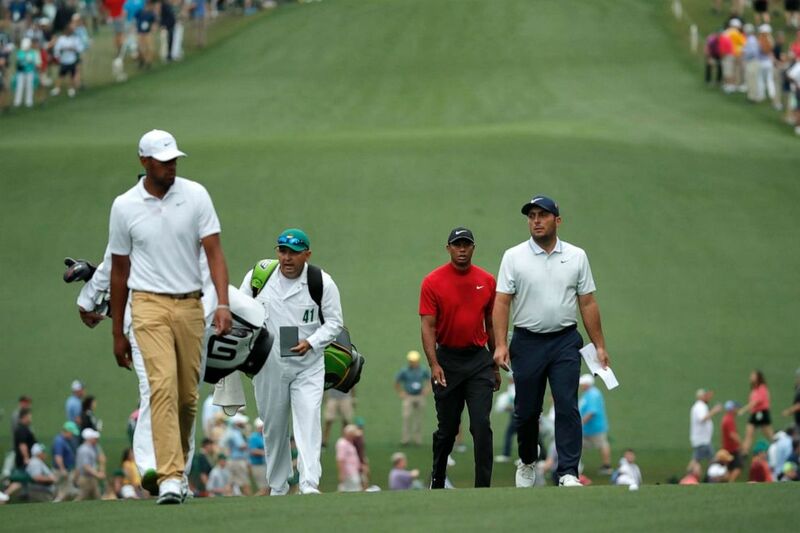 (Mike Segar/REUTERS) Francesco Molinari, Tiger Woods and Tony Finau walk up the first fairway during final round play at the Masters in Augusta, Ga., April 14, 2019. Woods’s marriage to model Elin Nordegren, the mother of his children, ended in divorce in 2010. (Andrew Redington/Getty Images) Tiger Woods plays a shot on the first hole during the final round of the Masters, April 14, 2019, in Augusta, Ga.
A series of operations on his knee and back hampered him on the golf course and prompted him to step away from competition on the links in December 2015 as his ranking as the No. 1 golfer in the world plummeted to 62nd. Woods began to find his stroke again last year in September when he won the Tour Championship at the East Lake Golf Club in Atlanta. While it wasn’t a major championship, it marked Woods’ first win on the PGA circuit since 2013.